Woke up just in time! The Wilkes-Barre Scranton Pens scored an early goal right off the bat, decided to fall back into a defensive game, took a nice 3rd period "nap," and then woke up just in time for overtime. That may be oversimplifying it a bit, but that's what it seemed like to anyone watching/listening to Abbotsford's first visit to Northeast PA.
Kevin Veilleux tipped one past Heat goaltender Matt Keetley 3:43 into the tilt to put the Pens up 1-0 right off the bat. 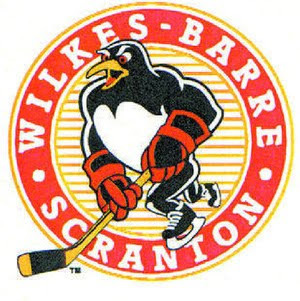 It seemed to be another classic offensive performane from WBS, but then they just stopped. They mustered only 3 more shots in the period while allowing 14 to the Heat, all of which were stopped by John Curry. The 2nd period was a scoreless 20 minutes of hockey in which the Pens actually did get some shots (13) but failed to convert on 3 golden PP opportunities. Curry was again perfect on the other side for the Pens. Then WBS really went to sleep in the third, recording just 3 shots (the 1st of which did not come until over 3/4 into the period) while enduring 9 from their Canadian adversaries. The last one finally did find its way past Curry to tie the game up with just 1:43 remaining and perhaps was just what everyone in the building needed to wake up and finish a hockey game. WBS was a whole different team in OT, and needed less than 2 minutes for Nick Johnson to tip in a Wagner blast for a 2-1 overtime victory and an important 2 points to get back on track after a rough weekend. I have to give a shoutout to Curry, who at times looked like the only Penguin out on the ice, and he really has stepped up to the plate in these last few games. I'm not making any premature predictions, but maybe the starting job scales have tipped in his favor after favoring Theissen for the majority of November.